This is what willpower looks like - still five left to drink! Since I’ve taken the day off to wait for parcels/finish building my new bike, I thought I’d have a much-needed clearout of the beer-bottles I’ve been keeping in my kitchen for goodness knows what reason. Besides, I’ve gotta make some room for the massive Brewdog order I have coming (excited much)! I know I’ve mentioned these fabulous 12 Stouts of Christmas a few times before so I thought I’d let you have a look before I chuck the empties. 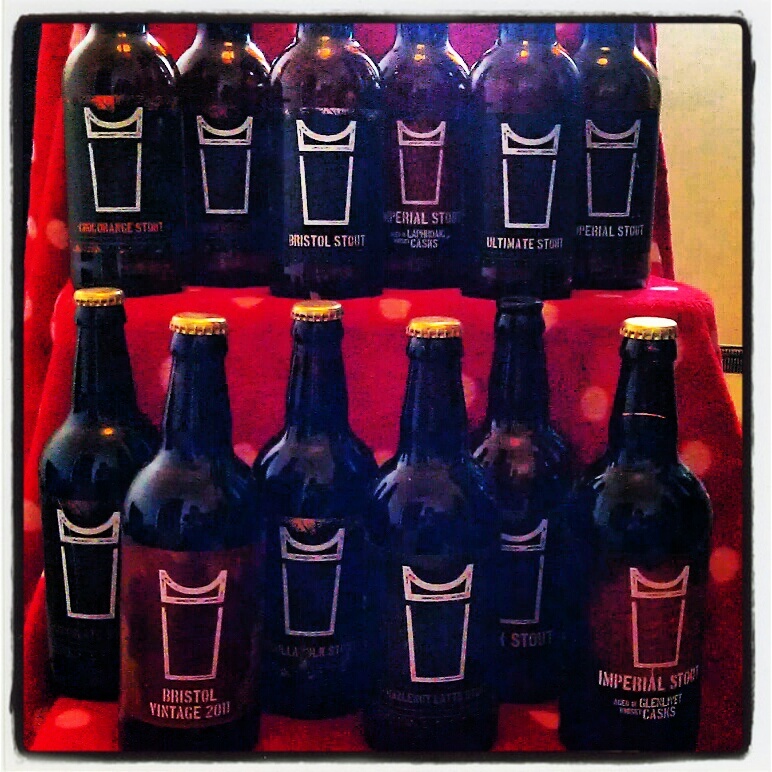 So here’s Christmas 2011’s Bristol Beer Factory sleigh-load of sumptuousness mmmmmm…. In case you were lucky enough to get your hands on this set and you’re wondering what happened to the Chilli Chocolate Stout, the stupid oafs at Fedex destroyed it so if you happened to get one, I’d love to know what it was like. The kind and beautiful people at BBF sent us a different one to replace it (can’t remember which though) even though this was the second box they sent (Fedex destroyed the first box. I still mourn those yummy stouts). Looking forward to Grillstock! Hope Bristol bring some more of that incredible Indian Ink to go with my barbeque ribs!